Dr. Tomas Hult is the Byington Endowed Chair, Professor of Marketing and International Business, and Director of the 27-person International Business Center (IBC), including staff and students, in the Broad College of Business at Michigan State University (John W. Byington was a former president of the NPD Group Worldwide Inc.). 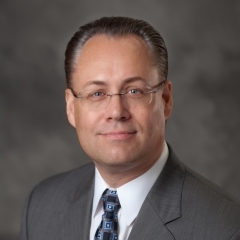 He has been at Michigan State University since January 2001, and has his faculty position in the Department of Marketing but also teaches for the Department of Supply Chain Management and the Department of Management. IBC is one of 15 centers designated by the U.S. Department of Education as a center of excellence in international business and trade (i.e., CIBER). On behalf of the State of Michigan, IBC serves as a Regional Export Network (REN) for 24 counties in mid-Michigan (Regions 5, 6, 7, and 9) as well as an international trade service/research provider for all of Michigan's 83 counties. Dr. Hult's expertise and research focus are in marketing strategy, strategic management, supply chain management, and international business. The Broad College did a faculty spotlight on him recently. He leverages his expertise on the radio show globalEDGE Business Beat, which he hosts on the Michigan Business Network, interviewing business leaders and top academics. Previously, Dr. Hult held positions as Eli Broad Professor of International Business; Professor of Marketing and Supply Chain Management; and Associate Dean in MSU's Broad College of Business. Broad is consistently ranked among the top 15 schools for both U.S. graduate and undergraduate public business programs. Broad is also consistently among the top 10 institutions in international business research globally. With more than 8,000 undergraduate, masters, and doctoral students, Broad is one of the largest business schools in the country. Broad is accredited by AACSB and a member of the Global Business School Network. MSU is one of 62 members of the Association of American Universities. Dr. Hult has been the Executive Director, Board Member, and Foundation President of the Academy of International Business (AIB) since 2004. He is President and Board Member of the Sheth Foundation, and Board Member of the International Trade Center of Mid-Michigan, Economic Club of Greater Lansing, and the Michigan Chapter of the German-American Chamber of Commerce as well as a member of the Swedish-American Chamber of Commerce. Dr. Hult serves as a Commissioner on the Lansing Regional Sister Cities Commission (appointed by the mayor in 2014). Dr. Hult was President of the coalition of CIBER schools in 2011-2012 and 2015-2016, which are funded by the U.S. Department of Education, and he serves as a political liaison for the CIBER network with the Coalition for International Education. IBC currently has grants from the U.S. Department of Education and the National Science Foundation, and contracts with the State of Michigan (MEDC) and Academy of International Business (AIB). Dr. Hult has been responsible for bringing in some $40 million to MSU's International Business Center. MSU's International Business Center is a strategic affiliate of the U.S. & Foreign Commercial Service of the U.S. Department of Commerce (USDoC). Since 2012, Dr. Hult serves on the USDoC affiliated District Export Council, and MSU's International Business Center maintains the web presence of both the West and East DECs in Michigan (with IBC member Dr. Tunga Kiyak serving on the East DEC). At MSU, Tomas has served on the International Studies and Programs Executive Committee, Honorary Degree Committee, MSU President's Search Committee, and the Broad College of Business Senior Administrator group, among others. He regularly works with some 25 internationally oriented units on the MSU campus, and IBC has facilitated more than 12,000 firms nationwide going international since 2006, with more than 2,000 firms from the State of Michigan. For example, the regional impact of IBCÃ???Ã??Ã?Â¢? ?s export programs have been tremendous for years (the export programs were started by the center in 2007). Under the auspices of IBCÃ???Ã??Ã?Â¢? ?s Michigan Export Growth Program (global.broad.msu.edu/megp), in the last year alone, 168 Michigan companies received IBC export assistance and attended events/trainings organized by IBCÃ???Ã??Ã?Â¢? ?s Global Business Club of Mid-Michigan. In 2018, these companies collectively generated $105.5 million in new export sales by achieving 939 new international market entries to 112 countries. It is estimated that one job is created for every $210,000 in export sales in Michigan. Consequently, these companies created (or at least sustained) an estimated 502 jobs in the state of Michigan during the 2018 fiscal year. Also, IBC conducted 30 business outreach programs involving 4,474 business people and 45 educational programs involving 2,336 higher education participants, ultimately impacting 154,980 students nationwide. In 2014, he started the "Byington Marketing Speaker Series," using funds from the endowed chair he holds to bring top marketing researchers to MSU's campus. Dr. Tomas Hult is a well-known speaker and executive trainer in marketing strategy, supply chain management, international business. In a short video interview, Tomas discusses his global strategy training. He regularly speaks at high profile events (e.g., United Nations Conference on Trade and Development, World Investment Forum, European Commission, Swedish Entrepreneurship Forum) and publishes influential op-ed articles (e.g., The Hill, Time, Fortune, Fortune, World Economic Forum, The Conversation). Some of his trade books include: Second Shift, featured in a "Talks at Google" (McGraw Hill) and Global Supply Chain Management (McGraw Hill Professional). He is also author of several academic textbooks, including the #1 market-share leading Global Business Today and International Business "franchise" with Charles W. L. Hill (McGraw Hill) as well as Partial Least Squares (PLS) Path Modeling (Sage). His dissertation from 1995 on the "internal marketing system" can be found here. He is also working on a fall 2019 release of a business trade book titled "The Reign of the Customer: Customer-Centric Approaches to Improving Satisfaction" (Palgrave) with Claes Fornell, Forrest Morgeson, and David VanAmburg, and is targeting the release of his new-to-the-market International Marketing textbook in January 2021 (McGraw-Hill). Based on his scholarship, Dr. Hult is a member of the World Economic Forum's Expert Network, a group of some 5,000 world-leading experts from academia, business, government, and NGOs who are committed to shaping the global agenda and improving the state of the world. He is also a member of the United Nations / UNCTAD's Network of the World Investment Forum. In research, Dr. Hult is one of the world's most cited scholars in marketing, international business, and supply chain management. He was ranked the 75th "most cited scientist in economics and business" (and 3rd in marketing) in the world by Thomson Reuters in their Essential Science Indicators covering a period from 1997 to 2007. In a 2012 study by Aguinis et al. (in the Academy of Management Perspectives), Hult was 6th among influential scholars who received their degrees since 1991 (he received his degree in 1995). Based on a University of Minnesota study, Tomas was 14th in citations among the worldwide marketing professorate. In a recently developed ranking methodology (P-Rank), Dr. Hult was #3 in marketing in the last 20 years. Overall, his research has been cited some 50,000 times per Google Scholar, making him currently the top cited scholar in the Broad College of Business (and among the top-cited at Michigan State University). He is Google Scholar top-ranked in marketing strategy, international marketing, and supply chain management, among the top-20 all time in marketing, and top-ranked among active international business scholars. Professor Hult was selected the Academy of Marketing Science / CUTCO-Vector Distinguished Marketing Educator as the 2016 top marketing professor in the world for scholarly career achievements. He is an elected Fellow of the Academy of International Business (one of 103 scholars in the world bestowed with this honor and one of only 6 marketing scholars). His work has also been recognized by the MSU Broad College with the Richard L. Lewis Quality of Excellence 2005 (The Lewis award is a service recognition given to faculty who have provided exemplary leadership to advance the mission of the college). At Michigan State University, Dr. Hult was recognized with the Beal Outstanding Faculty Award on February 5, 2019 (MSU's highest award "for outstanding total service to the University"). Dr. Hult was Editor-in-Chief of the Journal of the Academy of Marketing Science from 2009 to 2015, a top-50 Financial Times business journal. He is Consulting Editor for Journal of International Business Studies (JIBS); Consulting Editor for Journal of Supply Chain Management; and Associate Editor for Journal of Service Research; having previously served as Associate Editor of JIBS, Journal of Marketing, Journal of Operations Management, Decision Sciences, and International Journal of Research in Marketing. He also serves on the review boards of the Journal of Marketing, Strategic Management Journal, Global Strategy Journal, Journal of International Marketing, and International Marketing Review; having previously served on the review boards of Academy of Management Journal, Journal of Management, Journal of Retailing, and Industrial Marketing Management, among others. Dr. Tomas Hult jointly with his wife Laurie Hult, MD, are members of the John A. Hannah donor society for personal financial contributions to Michigan State University. A dual citizen of Sweden and the United States, Tomas Hult has resided in the U.S since 1987 and been at Michigan State University since January 2001. Tomas and Laurie have two children (Daniel and Isabelle) who are also Swedish-US dual citizens. Dr. Hult holds visiting professorships in the International Business Group of his native Uppsala University, Sweden (since 2013) and the International Business Division of Leeds University, UK (since 2010). Michigan State, Uppsala, and Leeds are all ranked in the top 10 in the world in international business research (e.g., Management International Review 2014). He is also a Research Associate for the American Customer Satisfaction Index (ACSI). With a background in mechanical engineering, Tomas worked for AB Uppsalabuss (Uppsala, Sweden) and Holmen AB (Hallsta, Sweden) prior to academe. Contact Tomas Hult at +1-5173534336 (Office) or hult@msu.edu. Find out more about Dr. Hult on Google Scholar, LinkedIn, Twitter, Facebook, Amazon, Web of Science Publons, ResearcherID, ResearchGate, Orcid, World Economic Forum's Expert Network, Academia.edu, YouTube, Mentors Guild, MSU Scholars, and MSU Expert. The address is: Tomas Hult, Michigan State University, Broad College of Business, 645 N. Shaw Ln., Room 7, East Lansing, MI 48864, USA. Browse the faculty page at broad.msu.edu/facultystaff/hult. Dr. Tomas Hult's articles are listed on his CV, which is available for download on this site. The Google Scholar page for Dr. Hult has a listing and citation impact of his articles, and the pdf files of the articles are available, in most cases, for download on his page on ResearchGate. Overall, Dr. Hult is currently the top cited scholar in Michigan State University's Eli Broad College of Business, and among the most cited marketing and international business scholars worldwide. Former Lansing mayor collaborates on a book with Broad faculty behind the remarkable “Lansing Works! Keep GM!”. Hult will accept the honor at the 2016 AMS Annual Conference May 19, 2016 in Orlando, Florida. Overseeing about 200 activities each year, IBC continues to meet its mission since its creation in 1990. Sparty is travels to discuss strategic partnerships with the Indian Institute of Management in Bangalore, India. Professors Sri Talluri and Tomas Hult accepted for publication in IEEE Transactions on Engineering Management. Community colleges around the nation expect to have about 24 percent of their programs fully internationalized by 2024.